Secure hotel reservations at the Hyatt Regency Minneapolis by August 4, 2017 or before the room block is sold out to receive the discounted conference rate of $179 plus taxes for single/double occupancy. Hotel reservations can be made by clicking the above button or by calling reservations. Government attendees will need to show government ID and receive the prevailing government per diem at time of check-in. The Resource Recycling Conference is proud to have chosen the Hyatt Regency Minneapolis as this year’s conference venue and host hotel. To get the most out of your conference experience we recommend you stay at the host hotel, where hundreds of recycling professionals will be an open door away. Your room reservation at the conference host hotel ensures lower registration rates for future years. We ask all attendees to please stay at the host hotel. 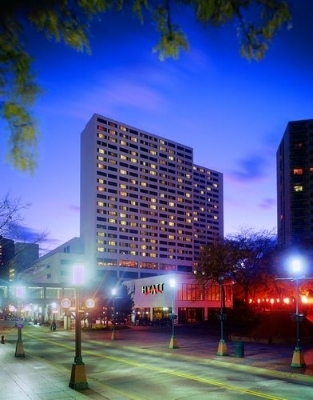 The Hyatt Regency Minneapolis provides the only official housing for the Resource Recycling Conference. Hotel reservations should only be secured directly with the Hyatt Regency Minneapolis online or by calling 612-370-1234. The Hyatt Regency Minneapolis will not make unsolicited contact with attendees or potential attendees to secure hotel reservations. It has been brought to our attention that third party hotel and travel companies have contacted attendees and potential attendees claiming to be the housing coordinator for Resource Recycling Conference. We have no affiliation with these third party housing coordinators. A few of these third party hotel and travel companies have been identified - EHM (Exhibitors Housing Management), Convention Housing Authority, Global Housing Services Corp., Global Housing Expo, Corporate Booking Services and others. The only official way to secure your hotel room is directly with the Hyatt Regency Minneapolis. Pick-up is on the lower level, outside of baggage claim. There may be additional charge for extra baggage. Taxis are required to offer a credit card option of payment. Shuttle service is available from the airport to hotels located in the Central Business District for $17 per person / one-way or $30 per person / round trip. Travel time averages 30 minutes. Reservations can be made by calling 612-827-7777. Light-rail transit (LRT) trains stop at both Terminal 1-Lindbergh and Terminal 2-Humphrey and connect travelers to 17 other destinations, including downtown Minneapolis to the north and Mall of America to the south. Both Uber and Lyft service the Minneapolis - St Paul International Airport. The approximate cost from the airport to the hotel is $15 - 23 for UberX or Lyft. The Hyatt Regency Minneapolis concierge will be happy to assist in arranging luxury sedans. Exit right out of the airport and follow signs to 494 West. Take 494W to 35W North. Follow signs for downtown to the 11th Street exit. Take 11th Street to 2nd Avenue, turn left. Continue past convention center. Turn right at Nicollet Avenue. Hotel and parking ramp will be on your left.